As a professed religious, I witness to the world the message of Jesus Christ. Often religious do this through our work in schools, in parishes, and in our various missions. I have come to understand that we witness to Christ not only in what we do, but in our very lives. My very existence should direct others to the Lord. This seems like a tall order, but a recent experience taught me how very ordinary it is. I professed vows in the Congregation of Holy Cross a little more than two months ago. Four days after doing so, I was in the wedding party of a good friend of mine. At the Groom's dinner, which was conveniently on Notre Dame's campus, my friends saw me in clerical shirt and collar for the first time. Some were a bit surprised, but for the most part reactions were muted. They knew me before, they knew I was in formation with Holy Cross. They expected this sight at some point. What stayed with me from that night occurred after the dinner. At about 9:00pm I headed back to Moreau Seminary. 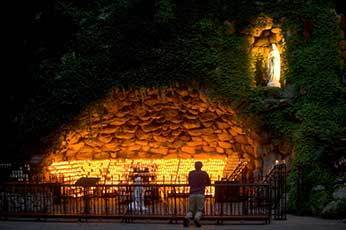 It was past dusk, and I was appreciating the glow from the Grotto as I walked past. A couple saw me wearing the clerics and the Holy Cross insignia, and moved to intercept me. Introducing themselves, they said they were from out of town and wanted to ask me some questions about the Grotto. This conversation quickly moved to my being a seminarian and professed religious, the role of Holy Cross in the United States, and then, to my surprise, to questions about prayer and their own struggles. After knowing me for all of three minutes they moved the conversation to some of the more pressing and personal matters on their minds. We talked a bit more, and as the conversation ended, we mutually promised prayers for the other, and went on our ways. This couple probably forgot my name within a few days, and likely my face in a few weeks. But that isn't the point, because my life is not about me. It's about Jesus, and presenting Him to others daily through me. That couple spoke to me not because of who I was as an individual, but because of what I am. They would never have stopped Gilbrian Stoy at the Grotto. They did stop a young man in a collar. All I have to do is get out of the way, and direct others along to the Lord. As Vatican II said, this occurs daily. "Religious should carefully keep before their minds the fact that the Church presents Christ to believers and non-believers alike in a striking manner daily through them." (Lumen Gentium 46). By being what I am, I present the Lord to the world. Yes, it is a tall order, but it can also be incredibly simple. Gilbrian Stoy, C.S.C. 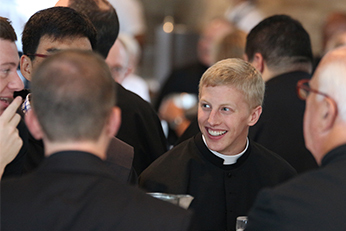 professed his First Vows at Sacred Heart Church in Colorado Springs, Colorado, in August of 2015. He then returned to Moreau Seminary with his seminary classmates to continue his studies and formation with the Congregation of Holy Cross. Gil is originally from Little Falls, Minnesota.